Background: Due to high content of fructose, honey has been introduced as a suitable natural sweetener for patients with type 2 diabetes. We investigated the effect of honey consumption on glycemic control and anthropometric measures of patients with type 2 diabetes. Methods: This randomized controlled crossover clinical trial was conducted on 53 patients with type 2 diabetes. The participants were randomly divided into groups of control (weight maintenance diet) or treatment (weight maintenance diet +50 g/day honey) for 8 weeks. After a 4-week washout, the second phase began, in which the role of the groups was interchanged. Blood glycated hemoglobin (HbA1c), glucose, insulin, and anthropometric characteristics were measured. Statistical analysis was performed with SPSS. Repeated measures of ANOVA were used to test differences within- and between the two conditions. Results: Forty-two patients completed the study. HbA1c significantly decreased in control (−0.22%, P = 0.03) and nonsignificantly increased in honey condition (+0.17%, P = 0.22). There was a significant difference between the two conditions (P = 0.02). Fasting glucose did not significantly change in either honey or control condition but insulin concentrations (−0.85 μU/ml, P = 0.01) and insulin secretion (−10.7%, P = 0.01) decreased significantly in the control condition. There was no significant difference in any of these parameters between the two conditions. Waist circumference decreased by honey treatment with a significant difference between the two conditions (P = 0.02). Conclusions: Eight weeks consumption of 50 g/day honey increased HbA1c and decreased waist circumference of patients with type 2 diabetes. Limiting simple carbohydrates, especially in the form of sugar-sweetened drinks and foods, is a general recommendation for patients with type 2 diabetes. Nonetheless, abstaining from sweets, beverages, and other sugar-containing foodstuff is not easy and diabetes patients always seek for substitutes that are less harmful than sugar. Honey is a natural sweetener which has been used from ancient times before production of sugar. The sweetness of honey is due to its high fructose and glucose content as well as small amounts of sucrose. Because of its high fructose content, honey has a low glycemic index although the glycemic index of honey may also be irrespective to its fructose content. Although animal studies have shown beneficial effect of honey on glycemic control,, results of human studies are still controversial: some of these studies have used a single dose of honey; the results of these studies cannot accurately demonstrate the suitability of honey for long-term usages. 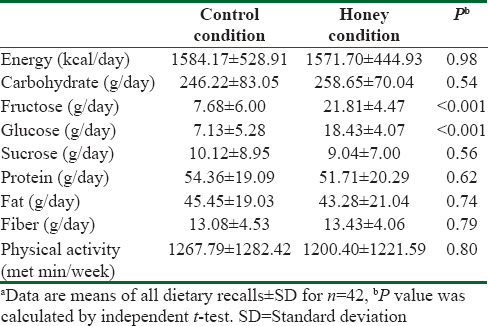 In two investigations, relatively long-term (2–4 weeks) effect of honey was evaluated., However, comparison of honey with simple carbohydrates, such as sucrose and glucose, as performed in these studies, makes drawing conclusion on the suitability of honey for patients with type 2 diabetes difficult because simple carbohydrates have high glycemic index and are not appropriate for doing comparison when participants are patients with type 2 diabetes. In the most relevant work, long-term effect of honey on diabetes patients was compared with no treatment in the control group; however, administration of high and incremental doses of honey (starting from 1 g/kg/day for the first 2 weeks to 2.5 g/kg/day for the last 2 weeks) that was used is unusual and does not imitate real consumptions. Therefore, the current study was the first that evaluated long-term (8 weeks) effect of moderate quantities of natural honey (50 g) on glycemic control, insulin concentration, and anthropometric measures of patients with type 2 diabetes. Furthermore, what privileges this investigation compared to previous works is the measurement of anthropometric indices, particularly waist and hip circumference in order to determine how this energy-containing intervention affects these characteristics. The study was a randomized crossover trial consisting of two 8-week interventions with a 1-month washout in between. A sample size of 26 in each group was determined according to a previous publication to detect a mean between-group difference of 25 mg/dl for fasting blood glucose change and a standard deviation of 4, power of 80%, error of 5%, and a dropout rate of 20% for a crossover design. Participants were 53 patients with type 2 diabetes, as diagnosed by an endocrinologist, selected from enrollees of health-care services of Nader Kazemi Diabetes Clinic in Shiraz, Iran. The fasting blood glucose of <200 mg/dl was required as an inclusion criteria. Patients with gastrointestinal disorders including fructose intolerance, malignancy, organ failure, pregnancy or lactation, and applicants of chemotherapy or immunosuppressive medications were not included. Hospitalization, insulin therapy, change of oral hypoglycemic medications, and loss of willingness to continue led to exclusion from the study. Written informed consent was obtained from all participants. The trial was approved by the Ethics Committee of Shiraz University of Medical Sciences (Approval no. CT-9374-7434) and registered with the Iranian Registry of Clinical Trials (IRCT 2015052222364N1 registered on July 26, 2015). The study was conducted from April through August 2015. A run-in period of 2 weeks was used, during which patients followed a weight maintenance diet that was continued until the end of the study. The weight maintenance diet was prescribed individually for each patient according to his/her energy requirements and based on World Health Organization guidelines for healthy diet. An exchange list was also provided to ensure that the participants freely choose their diet over a various food options. The study included two 8-week sequences separated with 1 month washout. In the first sequence, the participants were allocated to either honey (50 g/day + weight maintenance diet) or control group (weight maintenance diet), and in the second sequence, the role of the groups was exchanged. Allocation was performed by block randomization. Two investigators enrolled the participants and a third investigator generated the random allocation sequence and assigned the participants to the arms. With a block size of 4, six possible sequences of arms (A or B) were determined and numbered from 1 to 6. Using computer-generated random numbers, the sequences were ordered. The allocation of the participants to the intervention groups was performed according to this order. Natural unprocessed honey from milk vetch (Astragalus bisculatus) flowers was used. Major carbohydrate composition of the honey was as follows: 39.6% fructose, 33.3% glucose, and 3.0% sucrose as assessed by our biochemical laboratory according to the method previously described. Special measuring cups were provided for the participants to ensure consuming accurate amount of honey. The patients were asked to divide 50 g honey into three portions and to consume them between meals with beverages, such as water, tea, coffee, milk, or with snacks like yogurt, fruit, and vegetables. Because the participants were patients with type 2 diabetes, we could not designate a suitable and ethically approved placebo for honey; so the control group was only recommended to continue their weight maintenance diet and to exclude honey from their diet. Participants were asked to continue their usual physical activity and lifestyle and to refrain from special diets during the study. The administered amount of honey was within the range of recommendations for added sugar, and according to dietary guidelines of the American Dietetic Association for adults with type 1 and type 2 diabetes. Patients were advised to abstain from all sources of sugar-sweetened foods and beverages other than the honey that was prescribed in the treatment condition. Blood was collected at baseline and the end of each sequence of the study after a 12-h overnight fast. Serum was obtained through centrifugation of blood at 3000 rpm for 15 min and serum samples were frozen and kept at 70°C until the end of the study. Glucose (Pars Azmoon, Tehran, Iran), HbA1c (Pishtaz Teb Diagnostics, Tehran, Iran), and insulin (Monobind Inc., Lake Forest, CA, USA) were measured using commercially available kits. Homeostatic model of assessment – insulin resistance (HOMA-IR), as an index of insulin resistance, was calculated by the following equation: HOMA-IR = [fasting glucose (mg/dl) × fasting insulin (μU/ml)]/405. HOMA-β, as the indicator of β-cell function, was calculated as follows: HOMA-β = [360 × fasting insulin (μU/ml)]/[fasting glucose (mg/dl) − 63]%. Quantitative insulin sensitivity check index (QUICKI) as an insulin sensitivity marker was calculated as QUICKI = 1/(log fasting insulin + log fasting glucose). Well-trained dietitians performed anthropometric measurements and dietary and physical activity assessments at baseline, after 4 weeks and the end of each sequence. Anthropometric characteristics were assessed by a single investigator in order to reduce erroneous measurements, as described previously. Diet was evaluated by 3-day 24-h diet recall. Nutrient composition of the consumed foods was determined by Nutritionist IV version 3.5.2 (Hearst Corp., San Bruno, CA) using the US Department of Agriculture Food Composition Databases with additions for Iranian foods. A valid international physical activity questionnaire was used to assess physical activity. Physical activity was expressed as metabolic equivalent task (met min/week). Statistical analyses were performed with SPSS version 19 (SPSS Inc., Chicago, IL, USA). The normality of data distribution was examined by Kolmogorov–Smirnov test and data were log transformed where data were not normally distributed. Pairwise data were tested by paired samples t test. Repeated measures ANOVA was used to test differences within (time effect in each condition) and between (time × treatment interaction) the two conditions. The sufficiency of the washout period was evaluated by determining the carryover effect of a 2 × 2 crossover study by using ANOVA test, which was determined by STATA software version 12.0 (StataCorp LP, Texas, USA). P < 0.05 was considered as the significance level. Among the 53 participants, 42 (22 men and 20 women) completed the study. Eleven patients were excluded for reasons such as hospitalization and unwillingness to continue the study [Figure 1]. The participants were with the mean age of 57.5 ± 10.2 years, almost half men (52.4%), and mostly married (92.9%). According to inclusion criteria, participants were not on insulin treatment but were on control of hypoglycemic agents (92.9% metformin, 40.5% glibenclamide, 26.2% acarbose, 9.5% gliclazide, 7.1% glitazone, and 2.4% repaglinide). Biochemical, anthropometric, and dietary intakes of participants did not differ between the two groups at baseline (data not shown). The effect of honey consumption on fasting glucose, HbA1c, and insulin indices are demonstrated in [Table 1]. Fasting blood glucose was increased in both conditions but no significant difference was observed within or between conditions. HbA1c decreased significantly in control (P = 0.03) and increased nonsignificantly in honey condition (P = 0.22); a significant difference was observed between the two conditions (P = 0.02). 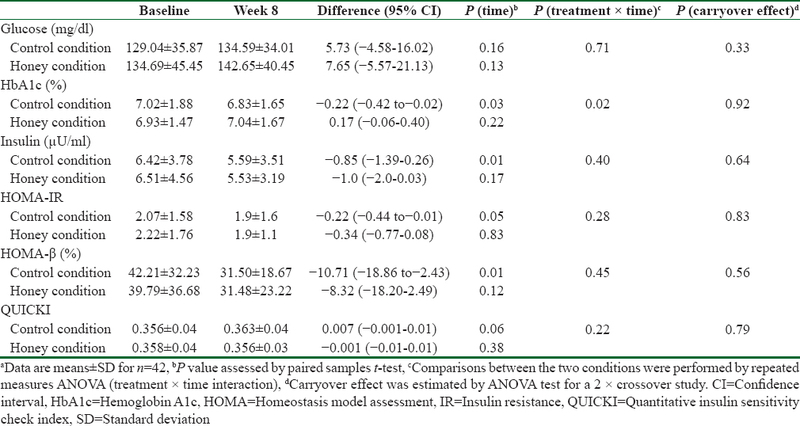 In control condition, fasting insulin concentrations and the marker of insulin secretion (HOMA-β) significantly decreased (P = 0.01) and insulin resistance (HOMA-IR) (P = 0.05) and insulin sensitivity (QUICKI) (P = 0.06) showed trends toward reduction. The same alterations for insulin concentration, resistance, and secretion were observed in the honey condition but the changes were not statistically significant. Weight and BMI significantly decreased in honey condition (P = 0.001) while hip circumference significantly decreased in both control and honey conditions (P = 0.004); however, no significant difference was observed between the two conditions [Table 2]. Waist circumference, waist-to-hip ratio, and waist-to-height ratio increased in the control and decreased in the honey condition; however, the difference between the two conditions was significant only for waist circumference and waist-to-height ratio (P = 0.02). No carryover effect was detected for any of the measured parameters. Evaluation of dietary intakes of study participants demonstrated that the mean intakes of energy, carbohydrate, protein, fat, and fiber did not differ between the two conditions, although the intake of fructose and glucose was significantly higher in the honey condition [Table 3]. The present work indicated that consumption of 50 g/day honey worsened glycemic control as evidenced by significant difference in changes of HbA1c between honey and control conditions. No significant change in fasting blood glucose, insulin, or markers of insulin resistance, secretion, and sensitivity was observed between the two conditions. In agreement with these results, human studies on the long-term effect of honey on glycemic control of diabetes patients are very scare; only two investigations have examined honey on glycemic control of diabetes patients or glucose-intolerant individuals. In agreement with us, in the most similar study, Bahrami et al. reported deterioration of glycemic control following ingestion of high and incremental doses of honey (increasing from 1 g/kg/day to 2.5 g/kg/day). However, in the other investigation by Raatz et al., honey consumption for 2 weeks had no effect on serum glucose in comparison with sucrose or high-fructose corn syrup. The discrepancy in the results of Raatz et al. with ours and Bahrami et al. studies could be due to the control condition: while Raatz et al. compared honey with sucrose and high-fructose corn syrup, we and Bahrami et al. compared honey with no-honey condition. Honey contains approximately 80% carbohydrates, with fructose and glucose being the most abundant., The ratio of fructose to glucose in honey varies from 0.46 to 1.62, depending on the floral source and climate circumstances. Fructose is a monosaccharide which slowly absorbs in the small intestine, rendering it to cause lower glycemic response compared to other carbohydrates. On the other hand, after absorption, liver picks up about 50–70% of the fructose independently of insulin. Due to these characteristics of fructose, honey may be assumed as a suitable sweetener for patients with type 2 diabetes. However, honey also contains high amounts of glucose which has a high glycemic index. Moreover, glucose itself expedites fructose absorption in the small intestine, and this effect becomes more prominent where equal amount of fructose and glucose is consumed. Hence, the glucose content of honey is an important factor in determining usefulness of honey for diabetes patients. The ratio of fructose to glucose in the honey used in this study was 1.18. Given that only a small quantity of fructose exceeded the amount of glucose, the detrimental effect of honey on HbA1c seems reasonable. The participants showed a significant weight reduction in honey condition and a significant difference in waist circumference changes between the two conditions. In agreement with this finding, Bahrami et al. found worsened glycemic control along with weight reduction following honey consumption. The reduction of weight may be causally related to deteriorated glycemic control as a result of glycosuria. However, as the weight reduction was also reported in the case of blood glucose improvement in overweight/obese individuals who consumed honey, it is possible that the effect of honey on weight is unrelated to glycemic control. Honey is a mixture of minerals, vitamins, antioxidants, phenolic compounds, and oligosaccharides. It is not unlikely if any of these or other unknown ingredients in honey exerts beneficial effect of honey on weight. For instance, small amounts of oligosaccharides in honey can delay gastric emptying, slow digestion rate, and prolong satiety. Also, a part of anti-obesity effect of honey may be exerted through reduced food intake by modulation of appetite-regulating hormones, such as ghrelin and peptide YY3–36. Moreover, phenolic compounds of honey may prevent weight gain by reduced calorie intake and increased fat oxidation. More studies around possible mechanisms are needed before a clear conclusion on of the effect of honey on weight can be reached. Both BMI and waist circumference are associated with increased risk of type 2 diabetes and cardiovascular diseases. In addition, results of a systematic review suggest that waist-to-height ratio is a more useful global tool for prediction of diabetes and cardiovascular disease risk than waist circumference., Our previous work, also, showed that waist-to-height ratio and to a less extent waist circumference is associated with the age-related increase in cardiovascular disease risk factors. Therefore, reduction of waist circumference and waist-to-height ratio may have beneficial consequences on overall health of diabetes patients. 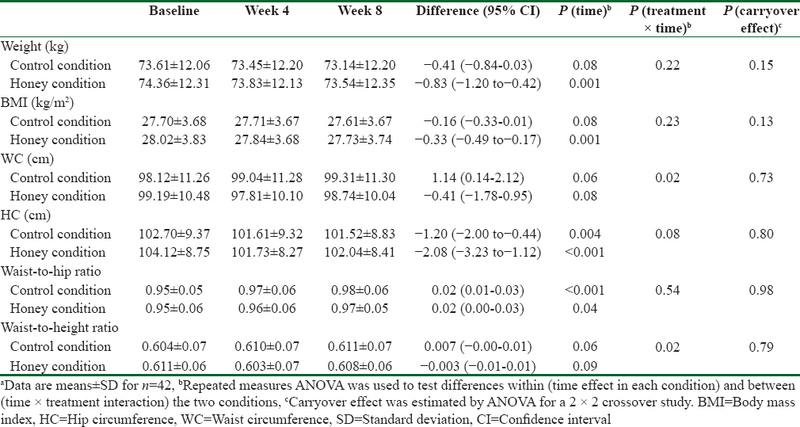 Although the size of changes that were observed in weight and waist circumference was small, such small effect size was observed during an 8-week intervention. Longer applications may cause more remarkable changes particularly when we note the increased waist circumference in the control condition. Nonetheless, the augmentation of HbA1c following honey consumption is a disadvantage that may surmount the beneficial effect of honey on waist circumference. Hence, educational strategies still need to advise diabetes patients to limit their honey consumption. Our study had strengths and limitations. We used a crossover design in order to decrease the effect of subject judgment upon the type of treatment. The use of natural honey and measuring anthropometric variables by a single investigator were also among strengths of this study. But we could not follow-up the participants for more than 8 weeks to see what the long-term effects of honey are on weight and waist circumference. Overall, results of this study showed that 8 weeks consumption of 50 g/day honey from milk vetch flowers increased HbA1c of patients with type 2 diabetes. Honey treatment also decreased waist circumference and waist-to-height ratio compared to the control. Although diminution of waist circumference may have favorable metabolic consequences, the increment of HbA1c may result in exacerbation of diabetes complications, suggesting that honey need to be consumed with caution by patients with type 2 diabetes. Future research need to examine long-term metabolic consequences of the reduced waist circumference on glycemic control and insulin resistance. The results presented herein were extracted from the thesis written by Ms. Fatemeh Sadeghi (grant no. 93-7434). Virginia A. American Diabetes Association Releases New Nutritional Guidelines. Available from: http://www.diabetes.org/newsroom/press-releases/2017/american-diabetes-association-2018-release-standards-of-medical-care-in-diabetes.html. [Last updated on 2017 Dec 08]. Bogdanov S, Jurendic T, Sieber R, Gallmann P. Honey for nutrition and health: A review. J Am Coll Nutr 2008;27:677-89. Deibert P, König D, Kloock B, Groenefeld M, Berg A. Glycaemic and insulinaemic properties of some German honey varieties. Eur J Clin Nutr 2010;64:762-4. Ischayek JI, Kern M. US honeys varying in glucose and fructose content elicit similar glycemic indexes. J Am Diet Assoc 2006;106:1260-2. Erejuwa OO, Sulaiman SA, Wahab MS, Sirajudeen KN, Salleh MS, Gurtu S, et al. Glibenclamide or metformin combined with honey improves glycemic control in streptozotocin-induced diabetic rats. Int J Biol Sci 2011;7:244-52. Chepulis L, Starkey N. The long-term effects of feeding honey compared with sucrose and a sugar-free diet on weight gain, lipid profiles, and DEXA measurements in rats. J Food Sci 2008;73:H1-7. Raatz SK, Johnson LK, Picklo MJ. Consumption of honey, sucrose, and high-fructose corn syrup produces similar metabolic effects in glucose-tolerant and -intolerant individuals. J Nutr 2015;145:2265-72. Abdulrhman M, El-Hefnawy M, Hussein R, El-Goud AA. The glycemic and peak incremental indices of honey, sucrose and glucose in patients with type 1 diabetes mellitus: Effects on C-peptide level-a pilot study. Acta Diabetol 2011;48:89-94. Bahrami M, Ataie-Jafari A, Hosseini S, Foruzanfar MH, Rahmani M, Pajouhi M, et al. 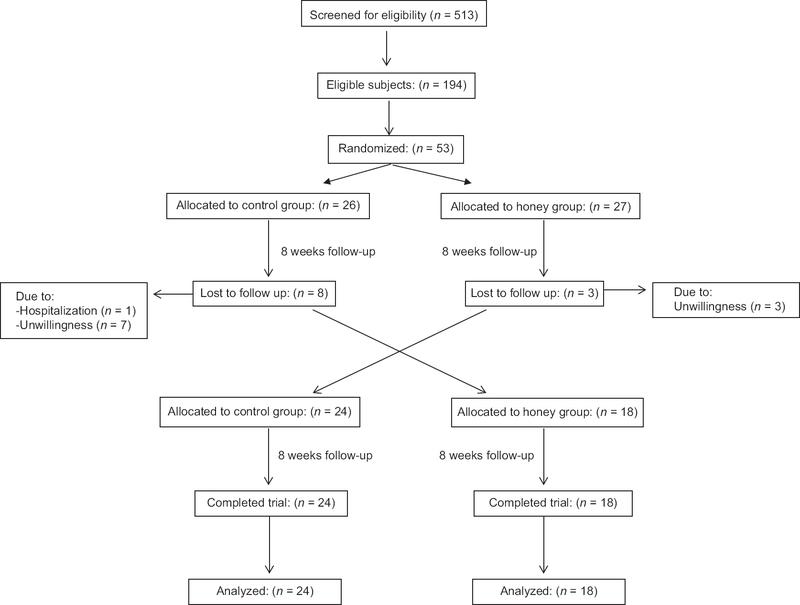 Effects of natural honey consumption in diabetic patients: An 8-week randomized clinical trial. Int J Food Sci Nutr 2009;60:618-26. World Health Organization. Healthy Diet. Available from: http://www.who.int/news-room/fact-sheets/detail/healthy-diet. [Last updated on 2018 Aug 24]. Steegmans M, Iliaens S, Hoebregs H. Enzymatic, spectrophotometric determination of glucose, fructose, sucrose, and inulin/oligofructose in foods. J AOAC Int 2004;87:1200-7. Dietary Guidelines Advisory Committee. Scientific Report of the 2015-2020 Dietary Guidelines Advisory Committee. Available from: https://health.gov/dietaryguidelines/2015/resources/2015-2020_Dietary_Guidelines.pdf. [Last updated on 2015 Sep 08]. World Health Organization. Guideline: Sugars Intake for Adults and Children. Geneva, Switzerland: World Health Organization; 2015. Franz MJ, Powers MA, Leontos C, Holzmeister LA, Kulkarni K, Monk A, et al. The evidence for medical nutrition therapy for type 1 and type 2 diabetes in adults. J Am Diet Assoc 2010;110:1852-89. Matthews DR, Hosker JP, Rudenski AS, Naylor BA, Treacher DF, Turner RC, et al. Homeostasis model assessment: Insulin resistance and beta-cell function from fasting plasma glucose and insulin concentrations in man. Diabetologia 1985;28:412-9. Katz A, Nambi SS, Mather K, Baron AD, Follmann DA, Sullivan G, et al. Quantitative insulin sensitivity check index: A simple, accurate method for assessing insulin sensitivity in humans. J Clin Endocrinol Metab 2000;85:2402-10. Akhlaghi M, Kamali M, Dastsouz F, Sadeghi F, Amanat S. Increased waist-to-height ratio may contribute to age-related increase in cardiovascular risk factors. Int J Prev Med 2016;7:68. Kurtze N, Rangul V, Hustvedt BE. Reliability and validity of the international physical activity questionnaire in the nord-trøndelag health study (HUNT) population of men. BMC Med Res Methodol 2008;8:63. Derakhshandeh-Rishehri SM, Heidari-Beni M, Feizi A, Askari GR, Entezari MH. Effect of honey vinegar syrup on blood sugar and lipid profile in healthy subjects. Int J Prev Med 2014;5:1608-15. Erejuwa OO, Sulaiman SA, Wahab MS. Fructose might contribute to the hypoglycemic effect of honey. Molecules 2012;17:1900-15. Kyaw MH, Mayberry JF. Fructose malabsorption: True condition or a variance from normality. J Clin Gastroenterol 2011;45:16-21. Erejuwa OO. The use of honey in diabetes mellitus: Is it beneficial or detrimental? Int J Endocrinol Metab 2012;10:444-5. List JF, Whaley JM. Glucose dynamics and mechanistic implications of SGLT2 inhibitors in animals and humans. Kidney Int Suppl 2011;120:S20-7. Yaghoobi N, Al-Waili N, Ghayour-Mobarhan M, Parizadeh SM, Abasalti Z, Yaghoobi Z, et al. Natural honey and cardiovascular risk factors; effects on blood glucose, cholesterol, triacylglycerole, CRP, and body weight compared with sucrose. Scientific World Journal 2008;8:463-9. Alvarez-Suarez JM, Giampieri F, Battino M. Honey as a source of dietary antioxidants: Structures, bioavailability and evidence of protective effects against human chronic diseases. Curr Med Chem 2013;20:621-38. Erejuwa OO, Sulaiman SA, Wahab MS. Honey – A novel antidiabetic agent. Int J Biol Sci 2012;8:913-34. Larson-Meyer DE, Willis KS, Willis LM, Austin KJ, Hart AM, Breton AB, et al. Effect of honey versus sucrose on appetite, appetite-regulating hormones, and postmeal thermogenesis. J Am Coll Nutr 2010;29:482-93. Akhlaghi M. Non-alcoholic fatty liver disease: Beneficial effects of flavonoids. Phytother Res 2016;30:1559-71. Qiao Q, Nyamdorj R. Is the association of type II diabetes with waist circumference or waist-to-hip ratio stronger than that with body mass index? Eur J Clin Nutr 2010;64:30-4. Shields M, Tremblay MS, Connor Gorber S, Janssen I. Abdominal obesity and cardiovascular disease risk factors within body mass index categories. Health Rep 2012;23:7-15. Browning LM, Hsieh SD, Ashwell M. A systematic review of waist-to-height ratio as a screening tool for the prediction of cardiovascular disease and diabetes: 0·5 could be a suitable global boundary value. Nutr Res Rev 2010;23:247-69. Ashwell M, Gunn P, Gibson S. Waist-to-height ratio is a better screening tool than waist circumference and BMI for adult cardiometabolic risk factors: Systematic review and meta-analysis. Obes Rev 2012;13:275-86. Mahfouz EM, Kamal NN, Mohammed ES, Refaei SA. Effects of mothers' knowledge and coping strategies on the glycemic control of their diabetic children in Egypt. Int J Prev Med 2018;9:26.